I'd been wanting to climb Abiel Peak for some time, and with a beautiful day and the grandparents in town to baby-sit, this seemed like a good time for it. Maren and I decided to walk in from the Pacific Crest trail, so we drove I-90 out to the Hyak exit (exit 54), then followed the road around through some new developments, and then turned in behind the sewage treatment plant. Following this logging road (#9070) we drove around the south side of Mt. 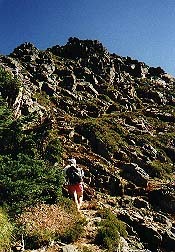 Catherine, eventually passing the trailhead to Twin Lakes (which is another starting point for this climb). 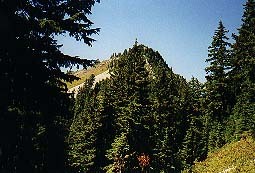 We continued up the logging road to where it crosses the Pacific Crest Trail, and started walking south from there. The trail passed through wonderful huckleberry fields, then entered forest. Now and then Silver Peak would appear in front and above us, with Tinkham Peak making an appearance now and then as well. I briefly investigated a path of sorts that looked like it might climb the east face of Silver, but decided that it would make a much better early season route, when the brush would be covered by snow. Continuing on we found the way trail that heads up to the saddle between Silver and Tinkham. From there we got a good view of the east ridge of Abiel, and could pick our route out. We headed up towards Silver Peak, turning west shortly before a small subsidiary bump on the Abiel ridge. Apparently we should have hugged this "bump" a little more closely, as we ended up traversing along the south side of the ridge, well below the crest. The going wasn't half bad, though, and kind of fun - forging our own way rather than following the boot tread of thousands of climbers. As we got closer to Abiel we climbed up towards the ridge, eventually intersecting with a well defined boot tread that was to take us to the summit. The trail was fun, with a few little rock steps thrown in here and there to provide a little variety. We arrived on the summit close to lunch time, and sat on some comfortable rocks enjoying the panoramic view - Humpback stretching out to Granite, all the peaks in the Snoqualmie Pass area, most of Commonwealth Basin and most of the Gold Creek Basin as well. It goes without saying that Silver and Tinkham Peaks were quite prominent. 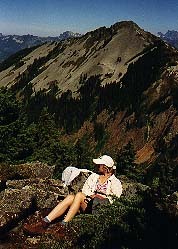 It was early enough in the day that we decided a two summit day would be fun - I had taken Maren up Tinkham Peak several years ago, and we thought it would be fun to do again, and compare what she thought of it now that we've been doing some real climbing for several years. We scrambled on down from Abiel, this time following the boot path all the way back to the Silver-Tinkham Saddle, then headed south along the north ridge of Tinkham. As the path works it's way upslope it frequently branches off in several directions - no worries, though - they all are working towards the same location. 15 minutes from the saddle we came out of the trees at the base of the Tinkham summit rocks. A short scramble later (there's a trail as well, but some fun rock if you'd rather) we were sitting on top, admiring similar views to those we had on Abiel, but also enjoying looking over to Abiel, where we had been just an hour before. As we were climbing down, we briefly discussed running up Silver Peak, but decided we'd rather use the time to pick huckleberries on the way out. Silver, Abiel and Tinkham would, however, make for quite a doable triple summit day - I'll save that for another time!